The sunset from the train window this evening is a fantastic apricot color. I just had a great evening walking around Greenwich Village with a friend- we got sandwiches, got lost, walked past the house where my maternal grandma grew up, and then got some delicious hazelnut gelato. Yum. It was an evening to remind me why I moved to NYC, there is really no where else quite like it. I do miss Belltown incredibly and I'm looking forward to spending a few weeks there soon, but it's hard to top the Village when the weather is perfect on an early Friday evening. And to go with my appreciation of life as a Jersey girl, I'm listening to some 80s hair metal music on my ipod- Jump, Come on Feel the Noize, Lay Your Hands On Me. Also in there is Hunger Strike by Temple of the Dog because I realized recently it's long been one of my underappreciated favorites. I'm sitting sideways on the train, watching the sun setting out the opposite windows, just enjoying the glimpses of the sun through the trees as they run past. If summer could last forever I would freeze it right here. I need to find my old HEALY photos. Would someone like to volunteer to find them on one of my old backup CDs? I've been on vacation, but I haven't gotten anything useful done with all this time, like organizing my photos. 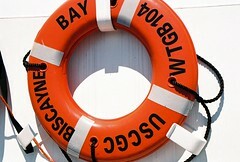 So here is one of the few photos from Dan's boats that's on flickr, from the USCGC Biscayne Bay in Michigan. This evening I stumbled over an old blog post I'd written about remembering what Dissolved Girl sounds like. It made me pause for a moment and think about my color memory vs my sound memory. I stopped at MJ Trim this morning to pick up a ribbon to match some green and blue material, and I've got the ribbon I picked out next to me. I haven't yet laid it next to the fabric it will go with, but I don't need to. For whatever reason, I can picture colors of things I've seen perfectly in my head, and when I looked at ribbons this morning I could see the exact olive and navy shades that I needed to match. Compared to my memory of songs, which are little soft, too loose, memories that unravel rather than get crisper when I dive in closer. Anyway. I like my color memory, but I wouldn't mind having a better memory for songs. When I read a lot of what I've written about music, I talk about what I see when I hear it and describe it in terms of spaces it suggests. I have a one track visual mind sometimes. This page, on the evolution of "kittah"/"lolcat" speak, was making the rounds today, and since I wanted to bookmark it so I'd be able to find it in the future, I figured I'd just toss it up on my blog. A Special In-Depth Analysis of the cat image macro speak world. On a similiar note, I was thinking this week about 1800s era novels. There's a particular feature of many of these novels that characters are called "Mr. R---" or "Mrs. L---". It's kind of cute, and occurs in a lot of writing from that time. This came up because I had four different conversations with friends who I've worked with in the past/work with now and in each coversation we were typing "A" and "G" (where "A" == amazon.com and for today you can guess what "G" is). This occured independently in each of those separate conversations, and it occured to me that it's a sort of convention among some circles these days to refer to employers by a single letter. For one, it's much shorter to type, but for another, it's a weak defense against the monitoring of email/IM/network traffic/etc that we all know goes on. It's just a little quirk that I noticed, and I was kind of fascinated how conversations adapt to limitations like the realization that the text being transferred between the participants is almost certainly being logged somewhere. Anyway, go read the kittah blog post. It's a neat analysis.